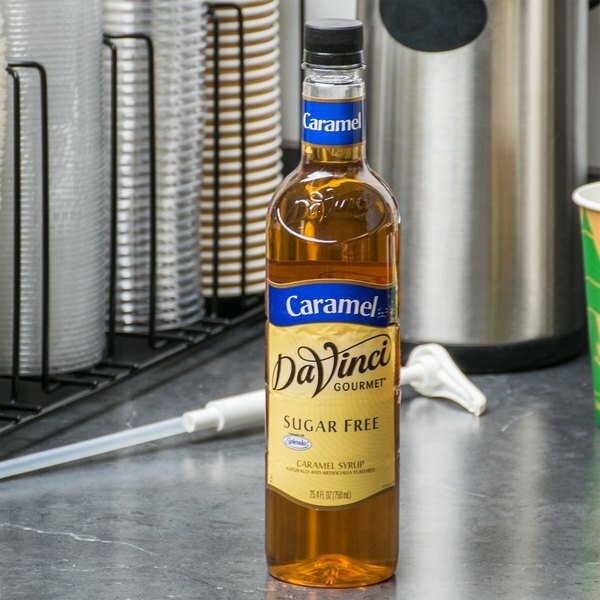 This user-friendly bottle of DaVinci Gourmet sugar free caramel flavoring syrup allows your busy baristas to quickly and easily serve up delicious hot, cold, or blended drinks with irresistible flavor without the sugar content! DaVinci Gourmet flavoring syrups complement your beverages without overpowering them or being too sweet. They are specially formulated to hold up well under heat, making them the perfect choice for espresso-based drinks, brewed coffee or tea, and more. Sweetened with sugar free, no-calorie Splenda brand sweetener, this sugar free blend is sure to be a treat for your health-conscious patrons! Splenda tastes like sugar, giving you great flavor without the calories. 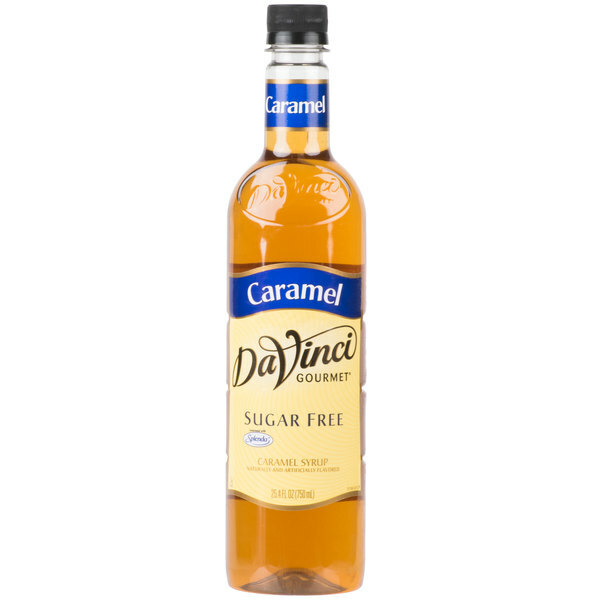 Sold in gourmet coffee shops, specialty food stores, food service outlets, and grocery stores, DaVinci Gourmet products, like this sugar free caramel flavoring syrup, have a long history of commitment to quality and superior taste. this is by far the most favorite sugar free syrup at our nutrition club. It's very flavorful and I love that it comes in a plastic bottle. Highly recommend! The sugar free caramel syrup is great and tastes amazing. My grandmother watches her sugar and loves caramel coffee. She was thrilled over this product and say it is the best caramel syrup ever. For those who are not supposed to have a lot of sugar due to diabetes .... they love this in their coffee! Many of the customers say the taste is great! Excellent product. We go through so many of these every month. I am so glad that they are so cheap because we buy these bottles all the time. This is definitely the most popular syrup that we have. 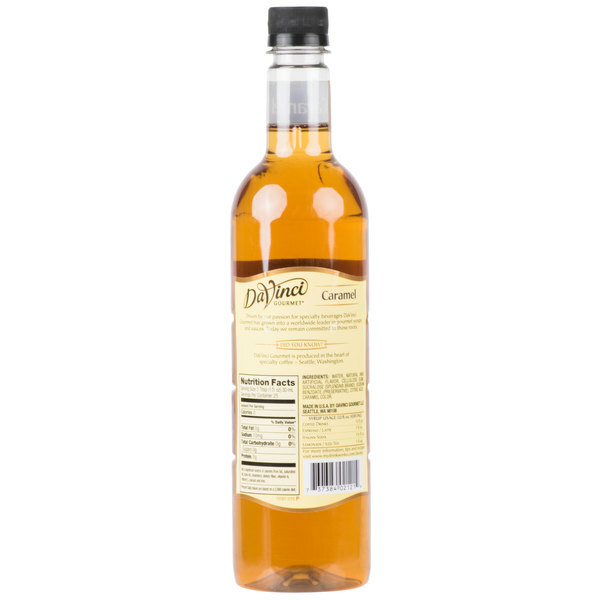 The DaViinci sugar free caramel flavoring syrup is top quality in both flavor and consistency. No weird after taste like with some sugar free syrups. A perfect coffee flavoring syrup.